World 2-4 is the fourth normal level of World 2 in New Super Mario Bros. 2. It is a level filled with Pokeys, Spinies, and Fire Snakes. It also has many blocks that stack up to form pyramid-like structures. This relatively short level is made up of walls which act as platforms. The level begins with Mario on top of one of them, where he meets a Goomba. A red Koopa Troopa appears with a Roulette Block located on another wall. The player needs to climb up the wall structures in the level. Several ? Blocks, a Red Ring and enemies such as Goombas and Fire Snakes can be found. This is followed by a Pokey, a ? Block and the Checkpoint Flag. A ? Block containing a Fire Flower can then be found. Spinies and Pokeys then begin to appear more frequently. The player needs to climb up another wall structure to the top, where a long, narrow hole with many coins can be found. Dropping down the hole leads to a yellow Warp Pipe, leading to the final area. A Pokey can be found between the yellow platforms and finally the Goal Pole can be found. Before the second Star Coin, there is a yellow pipe. The player must go down and they see two pipes that spawn Goombas. The Goombas can be jumped on to receive 1-Ups. A Gold Ring or a Gold Flower can also be used to obtain 1-Ups. 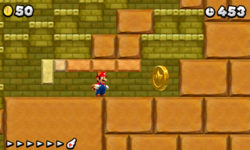 Star Coin 1: Early in the level, there are walls enclosing several areas with entrances that are narrow. Mario needs to go to the second one (not the one blocked by a Brick Block) and enter the enclosed area, where the Star Coin can be found. To enter as Super Mario (or powered-up Mario), the player will need to run and crouch to slide through the hole. Star Coin 2: This Star Coin can only be obtained with Super Mario or a powered-up Mario. On the second wall structure, the player will need to look for the first Pokey. There is a yellow Warp Pipe just beside it. The player needs to enter the Warp Pipe to an underground area. There, a Gold Ring can be found with several Goomba-creating pipes, where the player can earn extra coins. The player needs to Ground Pound a Brick Block sitting on a yellow platform and from the lower platforms, drop down to a platform which will lower to another hidden area. The Star Coin can be found on a stack of yellow platforms along with a Coin Roulette Block. Star Coin 3: Near the end of the level, instead of falling down the hole to the Warp Pipe, the player needs to continue to the right and drop down the holes to find the Star Coin. This page was last edited on April 9, 2019, at 17:56.